Our range of products include led professional display db55e, samsung commercial led display (lfd), led professional display db4oe, led professional display db32e, led professional display db48e and led professional display ed65e. 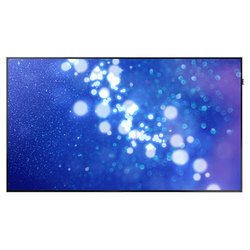 Samsung's DB55E displays offer advanced display technology in an affordable fashion. Deliver an outstanding visual experience with Full HD resolution on the 55" screen and a sleek, industrial design. A powerful CPU delivers accelerated performance, while a full range of connectivity inputs offer flexible content options. Higher reliability. LFDs are required to undergo stricter, more rigorous quality assurance testing under various environmental conditions. Stringent testing includes lifecycle, dust testing and power surges. Optimized display connectivity. LFDs offer RS-232C connection that provides you with a simple way to link multiple displays for access to broader range of digital content. 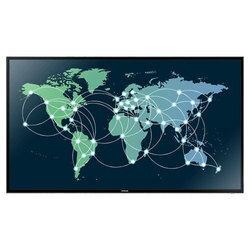 The accompanied multiple display control (MDC) program gives you easy control of all connected displays and content from one central location through the RS-232C connection. You can even merge the MDC protocol into your existing technology. ConnectivityConnect the display to other digital signage easily with interfaces based on your specific needs. The displays provide not only the essential connections businesses use the most but support for a wide range of source device types. Interfaces include HDMI, DVI, D-sub, Component and Composite input as well as RS-232C for extensive connectivity. Sustainable designSamsung digital displays emit less heat and carbon dioxide, use less energy, and are mercury- and lead-free. The eco-friendly design helps reduce your company’s environmental footprint. 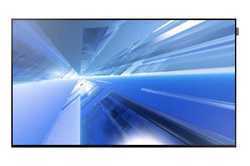 Samsung's DB40E displays offer advanced display technology in an affordable fashion. Deliver an outstanding visual experience with Full HD resolution on the 40" screen and a sleek, industrial design. A powerful CPU delivers accelerated performance, while a full range of connectivity inputs offer flexible content options. 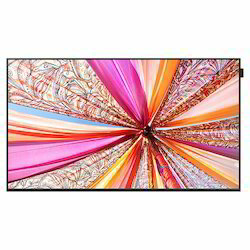 Samsung's DB32E displays offer advanced display technology in an affordable fashion. Deliver an outstanding visual experience with Full HD resolution on the 32" screen and a sleek, industrial design. A powerful CPU delivers accelerated performance, while a full range of connectivity inputs offer flexible content options. 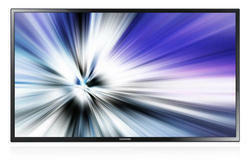 Samsung's DB48E displays offer advanced display technology in an affordable fashion. Deliver an outstanding visual experience with Full HD resolution on the 48" screen and a sleek, industrial design. A powerful CPU delivers accelerated performance, while a full range of connectivity inputs offer flexible content options. The Samsung ED65E commercial grade display is a simple, cost-effective and reliable digital signage solution for your business. It features side connectivity for flexible installation, with DVI, Component and Composite inputs. The large 65" LED screen offers high, full HD image quality, while the 3-year onsite warranty secures your investment and peace of mind. 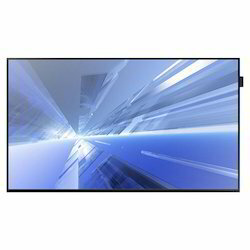 Looking for Samsung Professional Display LFD ?